There are a few new fashion trends emerging this fall as we enter a colder season- here are a few to follow and a few to avoid as you go shopping. One growing trend that is predominantly emerging from hipsters is the whole trend of wearing brightly colored skinnies. 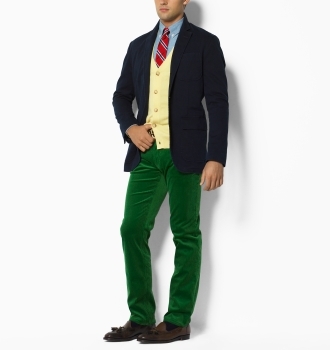 This can include jeans, plain chinos, or even, as pictured, cords. Avoid 'em. Skinny jeans appear to be on their way out quickly, as too many guys are now adopting them in all of the wrong ways. As I've said before, wear pants that fit you- not pants that make you look constrained and top-heavy. Images over zoomed in firefox (2x). Would all styles of the work boot be acceptable? Even the lighter, beige boots? To be honest that sounds a bit vague. 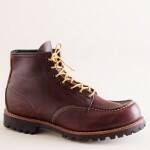 Some boots do look good and some make you look like a day laborer. So now we know. Classic pants, dress shoes, utility jacket, cardigan. Well, the cardigan for me is out of the question. Some men can pull it off quite well, I guess, but I just feel old and nerdy wearing one. I’d rather just feel young and nerdy instead. Any absolute no-nos from last season? Anything that will make people frown at me (or worse) and say “that’s so 2008”? Can I still wear my cool, thin, solid colour sweaters and get respect? Oh, and getting info on suits is always cool. But I doubt, given the origins of this place, that many people will actually wear them to work (if not college or high school). Good show nonetheless, kudos to Kirk!